After a landmark 2015 “Set of the Year” competition that saw the introduction of custom designed trophies and a juried format, NewscastStudio’s 2016 race will include the return of the popular hardware as well as the addition of a new category. 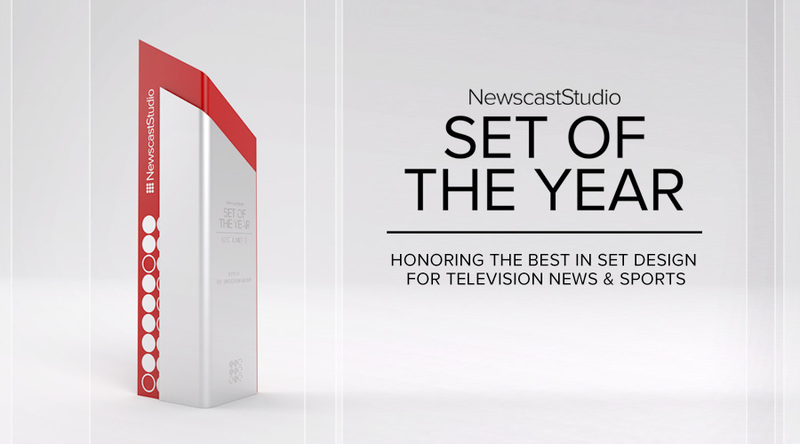 Indicative of the growing shift in broadcasting to Web-based programming, the newest category for “Set of the Year” will be Web Studios. This category will feature sets designed primarily for creating Web-based content and will help place special emphasis on the unique challenges of designing sets for this medium. The “Set Madness” fan vote portion will also return, crowning the Fan Vote winner after multiple rounds of elimination with all of the sets entered facing off head-to-head. NewscastStudio is also bringing back its custom designed, handcrafted trophies that have become a must-have item in the top designers’ award cases, proudly displayed side-by-side with Emmy awards and other honors. Set designers are able to enter their work for the contest, with each bonafide designer or firm receiving one complimentary entry. Additional entries are $75 each and winners receive one of NewscastStudio’s trophies. Additional trophies can be purchased by winners as well for clients or other team members. Judging for this year’s competition will be conducted by a panel of industry experts and insiders, with the names to be announced after the vote.